Miami University has been awarded a 2019 Senator Paul Simon Award for Campus Internationalization by NAFSA: Association of International Educators. On Friday, October 26th, Dr. Jesús Treviño, CEO and Founder of The Leadership in Diversity Group, visited Miami's campus to participate in information sessions for a new course offered by CAWC. On Thursday, October 18, 2018, the Miami University Center for American and World Cultures (CAWC) hosted an open house in MacMillan Hall to announce new staff members and all of the exciting new initiatives taking place within the center. 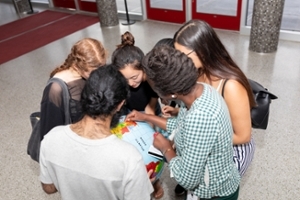 Explore five easy ways to expand your global horizons at Miami this fall. We are pleased to announce that Tarah Trueblood joined the Miami community on March 12, 2018 as the Director of Center for American and World Cultures. On September 23, 2017, Miami University and the Oxford, Ohio community are coming together for the annual UniDiversity Festival.